Being a member of a wedding party is draining. There are lots of emotions, and barely any time to process it. Especially if you’re running support for the main event—who’s running defense for your time-crunch breakdown? No one but you, that’s who. So here’s how to not go crazy. 1. Ignore anyone who makes the wedding a competition. Weddings are full of nonsense. But at some level, people are always trying to top the nonsense they saw at another person’s wedding. They want a better cake, better entertainment, more expensive musicians, etc. This typically isn’t everyone in the wedding party. Usually it’s just one person, i.e. the snooty father of the bride or the uptight wedding planner. Sometimes it’s the bride herself, trying to fit her wedding to match her Pinterest vision exactly. Rarely it’s the groom, trying to prove to someone that he can give his partner everything they want. Ignore those people. Seriously, ignore them. Weddings aren’t about competition, and anyone who tries to make them so only makes themselves look foolish. Reference the now-infamous dueling speech scene from Bridesmaids. No one benefits from competitive thinking in weddings, even on the smallest scale. Don’t even touch that sh*t.
2. Pick one Bridesmaid Speciality. No one bridesmaid can do it all, even if they’re the maid of honor. So do yourself a favor and mark your territory. 3. No means no means no. If you can’t pick up the wedding flowers, you can’t pick up the wedding flowers. Period. Society teaches us that the wedding party (especially bridesmaids) should be willing to bend over backwards for the bride. But making sure the dress doesn’t get messed up and scouting wedding locations for two days are completely different things. So if you can’t do something in service to the wedding, say no and hold firm. If you just don’t want to do something for the wedding, say no. If you’ve done Item #2 on this list, no one will be able to complain that you haven’t been helpful. It all works together! 4. Accept that guilt will happen. If you decide to accept the invite to become a bridesmaid, you’re accepting the fact that you will feel guilty at some point. It comes with the job. There’s always going to be someone who brought a better gift. Someone will always bring the thing that you forgot. You may even have to skip a key event. Just take a breath and let the feelings come. You’re probably doing just fine. At one moment during a wedding I was in, I finished my stuff on one side of town early and had a chance to the wedding-related event early. Too early. Like a crazy person, I drove home. I watched Steel Magnolias for ten minutes, then headed off to the wedding event. It took forty minutes to get home, then forty minutes to get to the wedding event. Yes, I realize that this makes me look like a crazy person. But I needed that tiny sliver of time to watch my movie. i was about to spend a few hours being an assistant for a bride. Waiting around for hours before that time would have only drained me further. I couldn’t serve other people if I didn’t serve myself first. It sounds silly. It runs counter to all the advice bridesmaids are typically given. But you have to take care of yourself before you take care of anyone else. Don’t forget that in the hustle and bustle. How do you care for yourself as a member of a wedding or a ceremony? 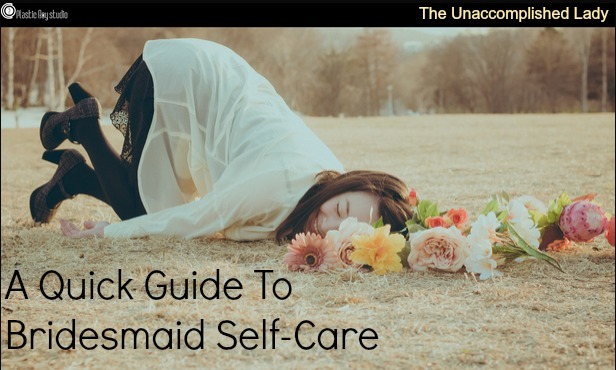 Do you think it requires a different kind of self-care? Tell us in the comments!